When it comes to getting news about government and politics, there are stark ideological differences in the sources that online Americans use, as well as in their awareness of and trust in those sources. Overall, when respondents are asked what outlet they turn to most often for news about government and politics, the most frequent mentions are two cable networks: CNN (named by 16%) and Fox News (14%). But wide ideological differences exist both in the sources that top the list for those on the left and right and in the degree to which there is reliance on a single source. Respondents with a roughly equal mix of liberal and conservative values also have a diffuse mix of news providers. CNN (20%) and local television (16%) are the most frequently-named top sources, with a long list of other news sources named by fewer than one-in-ten. Fox News (8%) is among the most-named sources in this “long tail,” along with Yahoo News (7%) and Google News (6%), both of which primarily aggregate and highlight news produced by other outlets. Respondents were asked first whether they had heard of 36 individual news sources. If they had heard of the outlet, they were then asked if they trusted it, and if they did not indicate that trust, they were next asked if they distrusted the outlet. The average web panelist has heard of about 21 of the 36 sources and trusts more of them than they distrust: 7.3 vs. 4.6, with another 8.7 that they neither trust nor distrust. There is variance, though, by ideology. Those with consistently liberal political values have, on average, heard of more sources than any other ideological group – on average, about 26 out of the 36 – and trust about twice as many as they distrust (10.5 vs. 4.8). Respondents with mostly liberal views or with about an equal mix of conservative and liberal views have heard of fewer sources, on average, but still trust more sources than they distrust. By contrast, those with mostly conservative political values, on average, trust and distrust about the same number of sources, about six each, while the average consistent conservative distrusts more media sources than they trust (8.8 vs. 5.6). The ideological differences also stand out when it comes to the specific outlets in which people place their trust. The sources trusted by the greatest percentage of respondents overall, along with those holding mixed political views, tend to be the most well-known. Three television-based outlets, CNN, ABC News and NBC News, are trusted by at least 50% of web-using adults. These three outlets are also trusted by similar shares of the large group of those with mixed political views. While consistent liberals trust CNN, NBC News and ABC News at levels similar to — or slightly higher than —respondents overall, these news sources are not the top most trusted among this group. Instead, three public news organizations – NPR (72%), PBS (71%) and the BBC (69%) – are the most trusted sources among those with consistently liberal political values. The New York Times also enjoys a high level of trust from this group (62%). In total, more sources (nine of 36) are trusted by 50% or more of consistent liberals than by any other ideological group. The most trusted sources among those with mostly liberal political values are similar to those of web panelists overall – but they trust these sources at higher rates. About two-thirds of those with mostly liberal political values trust CNN (66%), and majorities also trust NBC News (63%), ABC News (59%) and CBS News (55%). Conservatives, on the other hand, demonstrate strong allegiance to Fox News. Among those with mostly conservative values, Fox is the only source trusted by a majority (72%). And among those who are consistently conservative, nearly nine-in-ten (88%) trust it as a source — by far the highest level of trust by any ideological group of any single source. The other outlets trusted by the greatest proportion of consistent conservatives are the radio shows of Sean Hannity (trusted by 62% of consistent conservatives), Rush Limbaugh (58%) and Glenn Beck (51%), which each have a much narrower audience reach overall than Fox News. Levels of distrust in media sources also reveal pronounced ideological divides. Consistent conservatives are more likely to distrust these 36 media sources than are liberals or those with mixed political views. Among respondents overall (as well as those with mixed or mostly conservative views), no news source is distrusted by a majority. But those at both ends of the ideological spectrum stand out for their high levels of distrust in individual sources; consistent conservatives and consistent liberals are the only groups in which majorities distrust multiple sources. 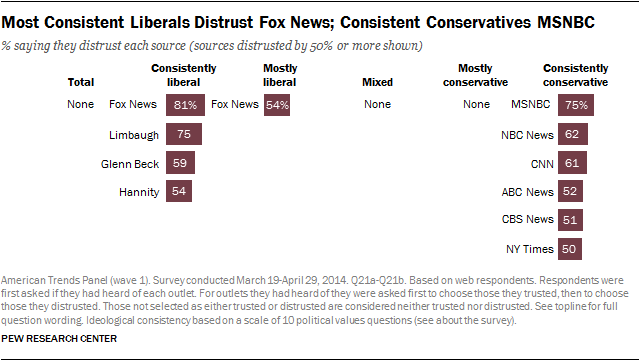 The outlets distrusted the most by consistent conservatives and consistent liberals are entirely different, but the high levels of distaste for the sources at the top of the lists are similar: Fox News is the most distrusted source among consistent liberals (81% distrust), while MSNBC is the most distrusted source among consistent conservatives (75%). Along with MSNBC, sibling network NBC is distrusted by 62% of consistent conservatives, slightly more than the share of consistent conservatives who distrust the two other network news sources (52% ABC News, 51% CBS News). CNN is also distrusted by about six-in-ten consistent conservatives (61%), while 50% say they distrust the New York Times. Notably, four of the sources distrusted by majorities of consistent conservatives are among the most trusted sources overall. Among consistent liberals, the radio programs of Rush Limbaugh (75% distrust), Glenn Beck (59%) and Sean Hannity (54%) round out the list of those distrusted by majorities. These same sources are the most trusted by consistent conservatives. Another way to examine attitudes across media sources is to look at the relationships between awareness and trust (or distrust) for news about government and politics. 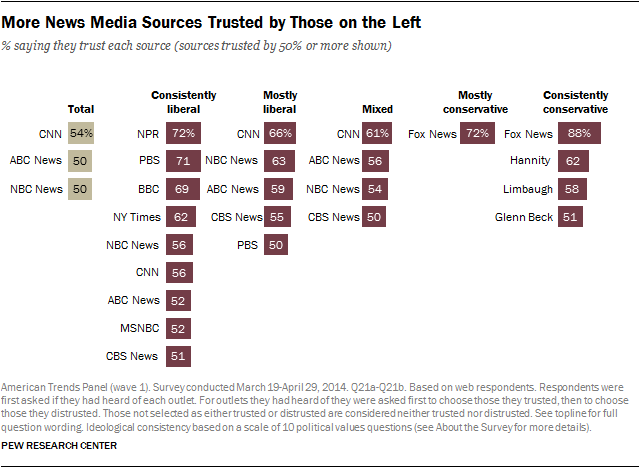 Some media outlets are better known than others and thus amass trust or distrust across a larger share of panelists. There are simply more people who know of them and have a view one way or another. 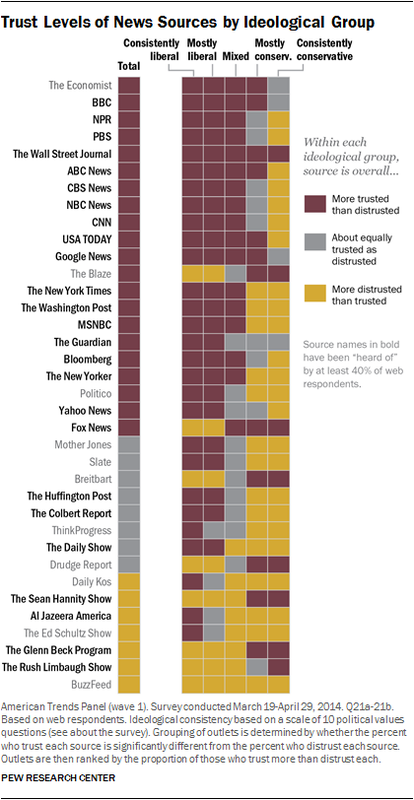 Other outlets elicit high levels of both trust and distrust, making it useful to look at the two measures side by side. And many outlets asked about here are only recognized by subsets of the public, but derive some trust or distrust from those who do recognize them. By contrast, the Glenn Beck Program is more distrusted than trusted. About half of panelists (48%) have heard of Beck’s radio program, and by about two-to-one, more panelists distrust than trust it (24% vs. 10%). An example of an outlet with very little awareness overall is Mother Jones: Only 22% have heard of it, and those who have heard of it are fairly evenly split between trust and distrust. And then there is Fox News, recognized by almost all respondents (93%), and with strong levels of both trust (44%) and distrust (37%). Only 12% do not offer a view on the outlet either way. Looking at the media landscape overall, there are a few areas of agreement in a sea of ideological disagreement. Only one source is more trusted than distrusted by all five ideological groups: The Wall Street Journal. Among consistent conservatives, 30% trust the Wall Street Journal for news about government and politics and 17% distrust it; among consistent liberals, 35% trust it and 14% distrust it. 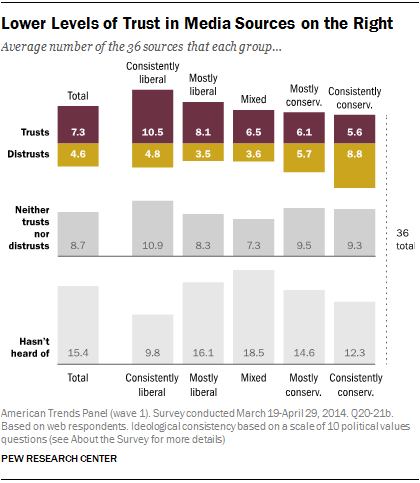 Among consistent liberals, fully 28 of the 36 sources are more trusted than distrusted. And though only eight sources are more distrusted than trusted by consistent liberals, six of them are overwhelmingly more distrusted than trusted: Fox News, the Drudge Report, Breitbart, the Glenn Beck Program, the Rush Limbaugh Show and the Sean Hannity Show. The list of popular sources these panelists turn to for political and government news often parallels the list of sources they are most likely to trust. Panelists were asked whether they got news from each of the 36 sources (plus local television news) over the past week, and while these data do not speak to the number of hours spent on each outlet, they do reveal distinct orientations that segment along ideological lines. 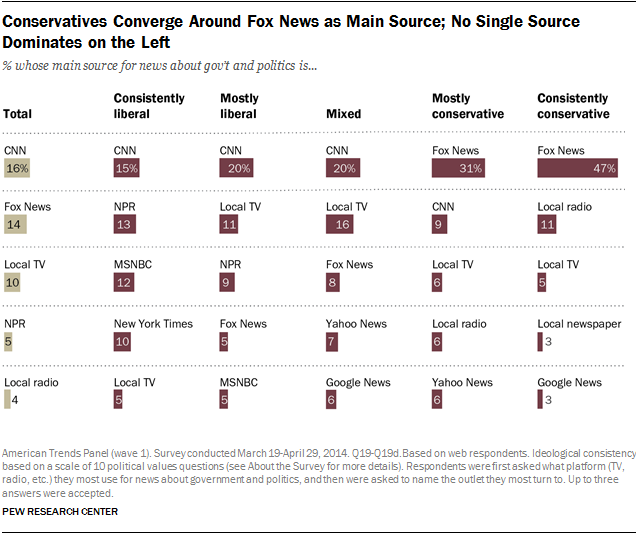 For example, consistent conservatives not only trust Fox News at high rates, but also coalesce around it as a source. Fully 84% of consistent conservatives got news about government and politics from Fox News in the past week. Other sources that appear at the top are the radio programs of Sean Hannity, Rush Limbaugh and Glenn Beck, as well as the Blaze. While Fox News has a large audience overall, the other outlets that consistent conservatives turn to do not have much reach beyond this conservative base. Fewer than 10% of digitally connected U.S adults got news about government and politics from any of these sources in the previous week. Even among those with mostly conservative political values, there is a drop-off in usage of sources like the Rush Limbaugh show, the Sean Hannity Show and the Glenn Beck Program. For instance, just 19% of those who are mostly conservative got news about government and politics from Sean Hannity’s radio show in the past week (compared with 45% of consistent conservatives). Far more in this group got news from sources such as ABC News (32%) and CNN (32%). 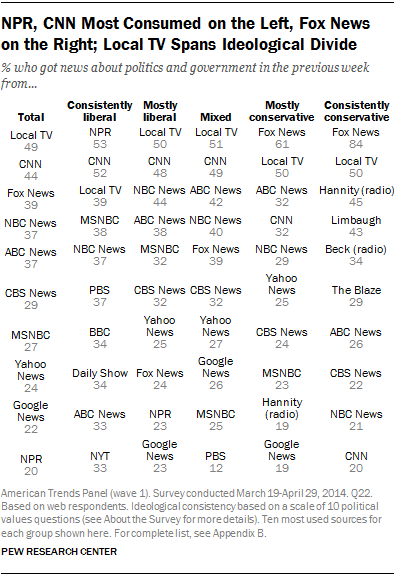 Consistent liberals, on the other hand, show signs of a more diffuse network of news sources. Ten of the 37 sources (local television was included in this consumption measure) were used by at least a third of this group for news about government and politics in the past week; by comparison, only five sources were used by a third or more of consistent conservatives in the past week. 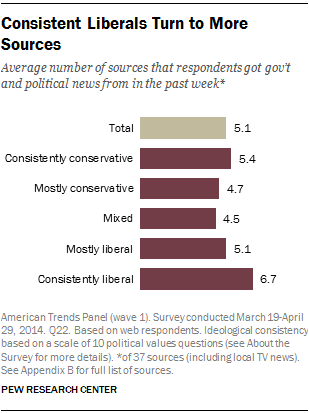 Still, several of the most popular sources among consistent liberals differ from other groups. About half of consistent liberals (53%) say they got news from NPR in the past week, similar to the share who got news from CNN (52%). But the public radio news network is far less central to the news diets of those in the other ideological groups. Even among those with mostly liberal views, just 23% got news from NPR in the previous week. Roughly a third of consistent liberals also got news from other sources that are less popular, such as PBS, the BBC and the New York Times. MSNBC was watched by 38% of consistent liberals, along with 32% of the mostly liberal and about a quarter of both the ideologically mixed (25%) and those who are mostly conservative (23%). Those with mixed ideological views (who also tend to follow political and government news less closely than those in other groups) gravitate to both broadcast and cable television sources. On average, consistent liberals turn to more sources for news about politics and government than do those in other groups. Those with consistently liberal political values say they got news about government and politics in the past week from 6.7 of the 37 news outlets the survey examined. Consistent conservatives turn to somewhat fewer sources (5.4), but more than those with mixed ideological views (4.5). 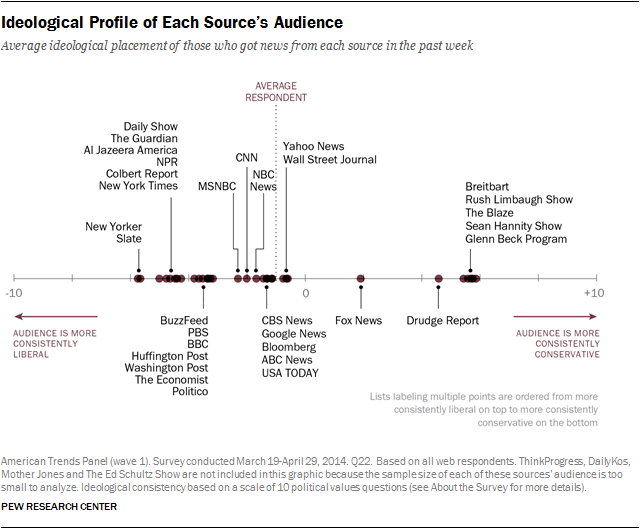 The different ideological preferences detailed above result in distinct audience profiles for each news source. Each source is placed on the line graph below according to the average ideological composition of those who use the source for news about politics and government. The dashed vertical line shows the ideological placement of the average respondent (just slightly to the left of someone holding an equal mix of liberal and conservative positions). For example, ABC News’s audience, on average, is very close to the average survey respondent. The New Yorker on the other hand is placed further to the left because its audience is, on average, more liberal. Overall, more of these outlets’ audiences fall to the left of the average respondent than to the right (and many cluster near the middle). But the overall audience distributions can differ even for outlets that are similarly placed. To help readers understand why sources are placed where they are, Pew Research has created interactive visuals for each outlet. Here are a few examples. On the continuum above, Fox News sits to the right of the midpoint but not nearly as far right as sources such as the Rush Limbaugh Show or the Glenn Beck Program. Looking at the audience breakdown helps explain why. Though those to the right of center make up a far greater proportion of the Fox News audience than of all respondents (46% vs. 26%, respectively), still less than half of those who turn to Fox News for political news in the course of a week are conservatives. MSNBC follows a pattern that is somewhat the reverse, though it has a smaller audience overall. Those with mixed political views make up a third (33%) of its audience, and about half of its audience is either mostly liberal (26%) or consistently liberal (22%); by comparison, 38% of all panelists are left of center. Conservatives account for 18% of those who turn to MSNBC for political news (14% mostly conservative and 4% consistent conservative). The Wall Street Journal’s overall placement, on the other hand, is at roughly the same spot as the average respondent, driven by the mostly even distribution of its audience across the continuum: 20% are consistent liberals, 21% mostly liberal, 24% mixed, 22% mostly conservative and 13% consistent conservatives. Notably, this distribution reflects the relatively low levels of usage of the Journal among the ideologically mixed (they are just 24% of Journal consumers, but 36% of all panelists). For other, smaller outlets, the audiences are concentrated much more on one ideological side or the other. The Daily Show’s audience for political news in the past week, for example, skews heavily to the left. Nearly three-quarters of those who get political news from the Daily Show in a given week hold liberal views: 45% are consistently liberal and another 27% are mostly liberal. By contrast, just 7% fall on the conservative side of the spectrum (6% mostly conservative and 1% consistently conservative). The remaining 21% have roughly an equal mix of liberal and conservative political values. The audience for the Rush Limbaugh Show, on the other hand, is decidedly conservative: About eight-in-ten (83%) of those who listened to Rush Limbaugh’s talk radio show in the past week have political values that are right of center. By comparison, a small proportion (3%) is left of center and 14% are in the middle. See our interactive to connect directly with this data and examine all the outlets in the survey.